We all have those days…or weeks. 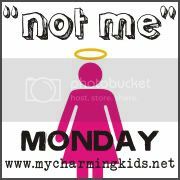 “Not Me” Monday was created by MckMama to give us an outlet to laugh at our own imperfections. Will you join me? When you are done here, you can head over to her blog and read about what everyone else has “not” been doing. I am very thorough when I cook, so I never leave out ingredients and my recipes never flop….especially when there are only four ingredients. I mean seriously, who would forget to put in one of only four ingredients?? Therefore it was not me who tried to make German Pancake this week, mixed the eggs, milk, and salt, but completely forgot to put in the flour. Nope, not me. And it was not me that, for the third time, hid something in the oven, forgot about it, and melted it when the oven was preheating. My son is not traumatized by said experiences, beginning with the time that I melted his tractors in the oven. What did you not do this week? February 11 – The kids love to lay on the bed while we are putting the sheets on. We will pop the sheet out and let it gently float down on top of them. It gets squeals and smiles every time. February 10 – Samuel shares our love for Pandora. This morning, he spent a long time sitting in the office chair just listening to music. February 9 – Scott got lots of help with one of his work projects. One of the many perks of working from home. February 8 – I got my new coat today!! February 7 - Every once in awhile, I will get a glimpse of myself in my children (usually they look like their father). This was one of those moments with Kaelynn. February 5 – Scott discovered early in our marriage that I have a secret love for these little heart cakes. He now goes in search of them and buys me a box every year around Valentine’s Day.